Home / Guide / Which pen plating kit would be best for you? Which pen plating kit would be best? There are many applications for our Pen Plating Kits, both decorative and functional. Some of the applications for this range of products are described below and this will guide you to making a good choice for which kit is best for your needs and budget. Please see the individual product pages to further help you in your choice. With all forms of electroplating including pen, brush and tank plating, great results can only be achieved if the surface of your item has been properly prepared. Please refer to the sections in this manual on surface preparation which includes cleaning and polishing. 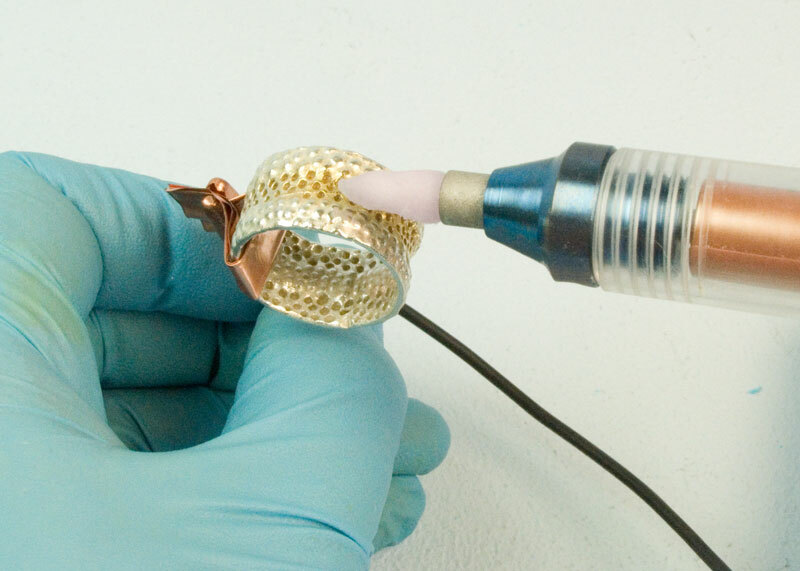 Our pen plating kits are very popular amongst jewellers, as pen plating allows jewellers to take control of the plating process themselves, avoiding the cost and inconvenience of having to send their work away to be tank plated. Our Battery Powered Pen Plating Kit is particularly popular as it is easy to use and takes up very little bench space. It is also very flexible as you can also use it for small brush plating jobs with one of our short electrodes and short swabs fitted. Selective gold plating, two tone plating, small batch production, repair work on claw settings of precious stones – all become far more manageable and within reach. Our wide range of pen plating solutions include gold, silver, palladium and rhodium as well as a range of Coloured Metal Mixers which can be mixed with our K-Gold to allow our customers to create rose, green and white gold pen plating solutions. Of course, our pen plating kit has been designed to take up the minimal amount of bench space, so one-off jobs are much easier to undertake and are far more economic. 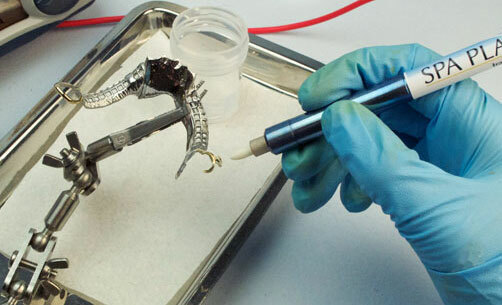 Our plating pens are popular with dental laboratories as they are great for small gold plating repair jobs. Also, an increasing number of scientific R&D departments in higher education and industry are turning to our pen plating kits to solve their high spec plating needs. Our plating solutions are extremely dependable and pen plating delivers just the right amount of plated metal in exactly the right place, without the need for large amounts of time-wasting masking out. The applications in electronics are huge; printed circuit boards, Hi-Fi equipment, scientific equipment such as photomultipliers – the list is growing as the industry recognises its potential. 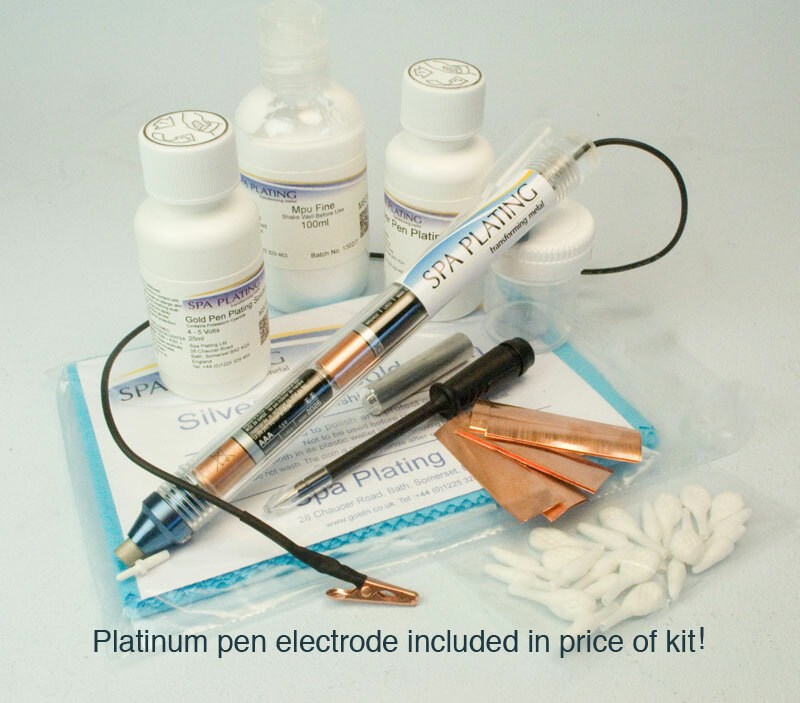 Along with our Battery Powered Pen Plating Kit we offer our our Gold Pen Plating Kit. Model making is a field where pen plating is making a real difference. Whether you’re a professional model maker or a keen amateur, our pen plating kits mean that adding that touch of gold to a treasured model is now much easier and straightforward. Pen plating is ideal for the hobbyist, as all the solutions are safe to use at home and the volumes involved are small and easily stored. 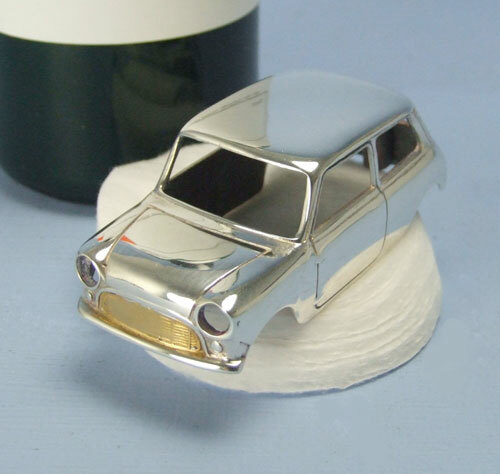 This model of a Mini has been selectively gold pen plated using our plating pen and gold pen plating solution. Gold plating plays an essential role in these fields and Spa Plating’s pen plating kits are proving to be increasingly popular with dental and surgical technicians. Our kits and plating solutions deliver consistently high standards, which is a vital consideration in the demanding world of medical technology. Our Gold Pen Plating Kit would be ideal for this group of applications. Pen plating can prove extremely useful to those working in the many branches of the antiques business. It allows you to do those small repair jobs quickly and efficiently, freeing you up to get on with the more time consuming task of running your business. Adding a touch of gold to pen nibs or details on small items of EPNS can really help to make the item more eye-catching and appealing to your customers. The Battery Powered Pen Plating Kit would be ideal for these occasional, one-off jobs. The links provided above in #4 – Gold Pen Plating Economy Kit & Gold Pen Plating Deluxe Kit – both go to a “404 Can’t Find That Page” Error message. Thanks for pointing that out – the problem has just been fixed!